Veterinary technician schools offer several different training paths and specialties. Even the savviest researchers can be quickly overwhelmed with the options, and varying state licensing requirements do not help. This guide offers prospective students a crash course in veterinary technician training programs, licensing considerations, and career paths. Vet Technologists and Technicians: Is there a difference? After Veterinary Technician School: What’s Next? Those looking for an emotionally rewarding program that teaches them to care for sick and injured animals may consider pursuing a career as a veterinary technician. Since many businesses and organizations have a high demand for veterinary technicians, there are many academic options available for prospective students. 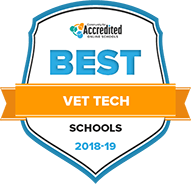 Through extensive analysis, we have found the top veterinary technician schools to help students find the right program for them. Explore the best veterinary technician schools below. Mississippi State University leads in innovation by being the third university in the nation to offer a bachelor of science in veterinary medical technology. The degree requires students to complete a minimum 120 college credits, with classes consisting of general education and veterinary technology focused coursework. Additionally, the program boasts an 83.33% VTNE pass rate and prepares veterinary technicians to be contributing members of veterinary health care teams. Possible work place settings for graduates include private veterinary practice, pharmaceuticals, humane societies, zoological parks and biomedical research. At Ohio State University, animal science majors can earn a bachelor of science in agriculture while simultaneously earning an associate of applied science in veterinary technology. This innovative opportunity is available to students through a joint partnership between Ohio State University and Columbus State Community College. The joint program can be finished in 4 years if students apply and receive admittance into CSCC's veterinary technician program their freshman year and follow a strict educational plan. Graduation requirements include completing approximately 124 credits. These credits include a set of predetermined courses along with a required internship. With this dual degree option, students are not only prepared to work as a veterinary technician, but they are also prepared for jobs in the fields of animal service management, disease control, public health and animal behavior. The pathway also provides a great foundation for graduate programs in veterinary medicine. Students interested in a vocational career in veterinary medicine may wish to complete the University of Georgia's veterinary assistant program. This program, offered through UGA's continuing education department, gives students a chance to be part of a veterinary team, helping veterinarians and technicians with various tasks, such as laboratory sample collection, assisting in surgery and dentistry, and animal restraint. Students can start this flexible program at any time. The program is only available online and takes 225 hours to complete. The program encompases 36 online modules followed by a final exam. Students are given 6 months to complete the intensive training once they register. Completion of the program provides students with the skills necessary to obtain entry-level positions. Although the program does not provide students with direct job placement opportunities, student can connect with program facilitators and UAG's career counselors to get guidance on building a resume, networking and advice on how to land a job. Tarleton University offers students the opportunity to earn an online Bachelor of Applied Science degree in veterinary technology. This degree fosters technicians' potential as it provides opportunities for students to go beyond their associate degree by broadening their knowledge in the areas of animal nursing, healthcare and animal practice management. The degree takes approximately 2 years to complete and is available to students that have graduated from an AVMA accredited veterinary technician program. Students have the option to choose between three clinical track specializations: equine, companion animal and veterinary practice. With a BAS, students not only increase their employment opportunities, but also their educational opportunities as this degree can be a great foundation for a graduate degree. Prospective students interested in becoming a vet tech can look into the bachelor degree in animal science at the University of Massachusetts-Amherst. The UMass-Amherst animal science degree prepares students for careers in animal health, animal biotechnology and agricultural production. Through this degree, students are immersed in a hands-on learning environment through the department's "barn to bench" strategy in which students will be in the barn assisting with animal birth one day, and running labs in the classroom the next day. Requirements for the program include maintaining a 2.0 gpa and completing approximately 120 undergraduate credits. The curriculum includes general education courses and core animal science courses such as animal welfare and animal genetics. The program also requires students specialize in either animal management or biotechnology. Graduates of the program can expect to find careers right after graduation in a variety of animal science settings such as zoos, animal control and animal shelters and clinics to name a few. With a degree from the University of Idaho, students can access promising careers in animal and veterinary science. At the University of Idaho, students interesting in becoming a vet tech can choose between 1 of 4 rigorous degree pathways in animal science and veterinary medicine. These emphasis areas include business, pre-veterinary medicine, production and dairy. However, students specifically interested in preparing for a career in veterinary technology should consider the dairy emphasis. Within this emphasis, students receive much of their learning in hands-on environments that include on-campus labs and animal shelters. Students study various topics essential to the field of veterinary technology that include animal nutrition and reproduction, farm management, and all aspects related to milk production. Students can prepare for a career in veterinary technology by connecting with the university's career services center. Each of the 4 emphasis areas can be completed in approximately 4 years and requires completion of about 130 undergraduate credits. With an animal science degree from Louisiana State University, students can begin working in various areas of the animal industry in about 4 years. These areas include production, nutrition, processing and animal care. At Louisiana State, students can complete a general animal science degree in which they will gain general knowledge in animal science, or students can choose to focus their degree in dairy foods technology, dairy production and poultry science. Course requirements for the degree program include general education courses such as English and math, a set of predetermined courses and a number of elective options so that students can generate a focus within their degree program. Students interested in becoming a veterinary technician can consider preparing for this career at Louisiana State and then work with the institution's transfer center to learn how to transfer their credits to a veterinary technician granting institution within the state. The College of Agriculture and Life Sciences at Texas A&M University-College Station provides a dynamic animal science degree for students interested in preparing for careers in a wide variety of areas in the animal industry. These careers include animal behavior, animal biotechnology, physiology of reproduction and care of companion animals and exotic pets to name a few. The animal science degree requires students to choose between an emphasis in production/industry or science. This program can be completed in about 4 years and requires students maintain a 2.0 GPA and complete a minimum 120 credit hours. Those interested in starting their education at Texas A&M with the goal of transfering to another Texas institution to complete a degree in veterinary technology should work with the college's academic advisors to develop a plan for transfer. Through its Department of Animal and Avian Sciences, the University of Maryland offers a Bachelor of Science in Animal Sciences with 3 tracks: animal care and management, pre-professional and pre-veterinary. While some graduates of this program do go on to graduate school, many enter the workforce in a range of careers, including veterinary technician. In this program, students learn about the biology of domestic and aquatic animals as well as the technology to properly care for and manage them. Aspiring vet techs can pursue the animal care and management track, which emphasizes hands-on learning through the on-campus farm and internships. Penn Fosters Veterinary Academy offers accredited veterinary and pet care programs that can be completed entirely online through Penn Fosters College and Career School. Veterinary technicians could almost be described as the nurses of the animal world. When animals get sick or injured, vet techs examine them, administer first aid, collect laboratory samples, and perform certain tests under the direction of licensed veterinarians. Providing this type of hands-on animal care requires formal training and, in most cases, professional licensure. Candidates must graduate from veterinary technician schools accredited by the American Veterinary Medical Association (AVMA) and pass the Veterinary Technician National Exam to be licensed. The AVMA has accredited more than 200 veterinary technician schools in the United States, including a handful of online programs. Associate degrees are by far the most common training path, but some students can begin with certificates or earn bachelor’s degrees instead. The North American Veterinary Technician Association reports that demand for more specialized technicians has resulted in more programs offering targeted training in areas such as dental health, surgical technology, nutrition, zoological medicine, and more. Prospective students can visit the AVMA website for a complete list of accredited veterinary technician schools, including the following types of institutions. Vocational and technician schools offer certificates, diplomas, and degrees designed with career readiness in mind. Program lengths vary, but some vocational schools offer accelerated programs that minimize general education requirements in favor of more industry-focused curricula such as animal anatomy, veterinary pharmacology, and parasitology. Most schools require students to complete internships with local veterinary practices, and vocational programs are no exception. Because career schools are popular among working professionals, evening, weekend and even online classes are common. Prospective students can call or visit schools online to clarify learning options, program details, and accreditation status. Many community colleges offer veterinary technician certificates and associate degrees. Some even have career development and continuing education courses for practicing techs seeking re-certification. Because community colleges serve both university- and workforce-bound students, many veterinary technician students complete a balance of general education and specialized courses-a trend that makes these programs a solid fit for students mulling over advanced degrees in areas such as veterinary technology or veterinary medicine. Whatever students’ goals, community colleges offer much of the same veterinary technician training as career colleges, but with a public school price tag. Program lengths vary, but usually require two years or less of full-time study. Most community colleges publish veterinary technician curricula, course descriptions, and graduation requirements online for easy review. Some four-year colleges and universities offer bachelor’s degrees in veterinary technology, but the U.S. Bureau of Labor Statistics reports that they are far less prevalent than the certificate and associate degree programs community colleges and vocational veterinary technician schools commonly offer. Nonetheless, the additional two years of study means students can hone a much deeper understanding of animal disease, veterinary radiology, surgical nursing, anesthesia, and other advanced topics. Additional courses in areas like lab animal science and clinical procedures can also help students qualify for careers as licensed veterinary technologists. Like community colleges, four-year schools usually require veterinary technicians to supplement this specialized coursework with general education classes in. Independent veterinary technician schools are incredibly rare: vocational schools, community colleges, and four-year colleges account for almost all programs in the United States. There are, however, other options for students who do not have access to these institutions. The American Veterinary Medical Association has fully accredited a handful of online veterinary technician schools, though that number is likely to grow with time. Alternate training routes are another option for students unable to complete formal education, but are state-dependent. In California, for instance, the California Veterinary Medicine Practice Act allows residents who do not have degrees but meet other requirements-such as having 300 hours of relevant education and nearly 4,500 hours of practical experience-to become registered veterinary technicians. With so many different program options available today, some aspiring veterinary technicians may find it challenging to find the perfect program. There are hundreds of accredited veterinary technician schools in the United States, and a small-but-growing share of online programs makes training even more accessible. Each school strives to be unique, which means no two are ever truly alike. Degrees, courses, learning platforms, and even student services vary. What should savvy researchers look for when weighing their options? The following criteria are a good start. Accreditation refers to a process by which independent organizations review and certify that veterinary technician schools’ curricula, resources, policies, and practices meet set program and quality criteria. Most students must earn a degree or certificate from an accredited program in order to be licensed, but even those not subject to such requirements can use accreditation as a measure of program quality and consistency. There are several state and national accrediting agencies, but AVMA is by far the most widely recognized organization. Prospective students can visit the AVMA online to review approved programs. The field of veterinary medicine has no shortage of degree and certificate options, but some are better for veterinary technicians than others. The BLS reports that the vast majority of veterinary technology schools offer associate degrees. Most states and employers require these two-year credentials, and those that do not will likely follow suit in the near future. This shift means most certificates are now more suitable for veterinary assistants who perform little to no clinical work. Four-year bachelor’s degrees are rare, but generally cater to future veterinary technologists in clinical laboratories. Some veterinary technician schools offer special career certificates, not to be confused with postsecondary certificates. Like human medicine, veterinary medicine spans several different areas. Some veterinary technician schools allow students to specialize in one or more of these areas through certification programs and targeted associate degree tracks. Employer demand for this specialized training is so fierce that the NAVTA launched a Committee on Veterinary Technicians Specialties to address it. The Committee, recognized by the AVMA, awards Veterinary Technician Specialists designations to techs with focused training in areas such as veterinary dental care, anesthesia, zoological medicine, clinical practice and surgical technology, among others. Prospective students should consider their options and choose tracks that meet their personal and professional interests. Veterinary technicians perform vital tests and exams, often times using sophisticated equipment, on scared patients, many of which have claws and fangs. Everyone involved benefits when techs know how to use these tools in a way that minimizes fear, injury, and other risks. Schools that offer hands-on experience using these tools with live animals give graduates an edge in this area. That being said, prospective students should research schools’ facilities, including labs equipment, and look for opportunities that will put them in touch with live animals. The latter is especially important for students specializing in zoological or exotic animal care. Learning how to perform various procedures and tests is a big part of veterinary technician training, but doings so in a busy practice with paying customers is its own special skill. Internships offer precisely this type of clinical training. In fact, internships are considered such an essential part of training that the AVMA only accredits veterinary technician schools that require them. Even online schools must follow suit, though students can usually complete an internship at a local practice. Internships are a valuable part of any school’s curricula, but finding them can be tricky. Excellent coordination and support services minimize this stress. Future students should consider internship components and related services when comparing schools. Veterinary technician schools offer a wide range of credentials. Certificates are the most basic, conveying the most fundamental skills and knowledge. This means that they may be more suitable for veterinary assistants who perform few clinical tasks. Associate degrees are by far the most common training path. These programs usually require about two years of study and focus on the skills that veterinary technicians will put into practice every single day while on the job. Almost all states require veterinary technicians to earn associate degrees to practice. Bachelor’s degrees the least common and tend to be clinical programs geared towards veterinary technologists. In fact, according to the BLS, most of these four-year programs target veterinary technologists working in scientific laboratories-not technicians in veterinary practices. These programs may nonetheless appeal to technicians looking for a competitive edge or considering more advanced careers in the field. Associate degrees are hands-down the most popular credential that schools offer for vet techs. Associate of Science (A.S.) and Associate of Applied Science (A.A.S.) degrees in Veterinary Technology, Veterinary Science, or Animal Science are just a few examples of academic options. Some associate programs also offer concentrations in NAVTA-approved specialties. At this level, 75 to 80 credit hours is typically the norm, which equates to approximately two years of full-time study. Accelerated options, however, can reduce this time to 18 months or less. Most veterinary technician schools require students to take general education classes in areas such as math, social science, and English in addition to core veterinary coursework. Laboratory classes and practical internships round out the degree program. This course includes requires both classroom and laboratory work. The former introduces students to basic veterinary medical terminology, animal behavior and nursing care. The laboratory component provides hands-on experience handling and treating live animals through a local or campus-based clinic. Biology is a common prerequisite. Students enrolled in this class study and compare the anatomy and physiology of dogs, cats, birds, mice, horses and other domestic animals. They learn about individual organs and biological systems, including skeletal, circulatory, digestive and respiratory systems. This class introduces veterinary medicines, their practical application and common side effects. Students will study when to use what medications, and with which species. They will also learn to properly administer, handle and properly dose medications. This required component gives students practical, hands-on experience in real veterinary practices under the direction of licensed veterinarians. Students must successfully complete at least 200 hours of externship and a campus-based seminar to graduate. Though rare, some schools do offer bachelor’s degrees, but these programs generally tend to be more tailored toward future veterinary technologists in medical and scientific laboratories. Vet techs may still enroll in such programs, whether to boost their resumes or open doors to more advanced careers in the near future. Bachelor of Science (B.S.) degrees in Veterinary Technology, Veterinary Science or Animal Science are common options. These programs typically require about 120 credit hours, or four years of full-time study, but special completion programs can minimize requirements for students with relevant associate degrees. Students seeking bachelor’s degrees complete a balance of general education courses, core courses, and specialized electives in both classroom and laboratory settings. Upper division courses can be highly technical and commonly include mandatory capstone projects or practicums. Some programs offer targeted specialty tracks in areas such as veterinary, clinical, and hospital management. The following table features typical classes from actual veterinary technology bachelor’s degree programs. This course introduces students to the safety and regulatory laws and best practices that impact veterinary technologists in medical and scientific settings. Units typically cover personal and patient safety; human resources; license and permit requirements; occupational health regulations; and ethics. This mandatory course offers students a high-level understanding of the role and scope of research in the field of veterinary technology. Common themes include basic research strategies, methodologies and design. Students enrolled in this core course learn leadership theories, concepts and principles relevant to veterinary technology management. Topics include leadership development, communication, organization and behavior. This course requires students to apply what they have learned in a professional capacity, usually through internships or supervised research projects. It is usually offered during students’ final semesters; students must earn a C or higher to graduate. Stricter state licensing standards have made veterinary technician certificates and diplomas virtually extinct. Only experienced techs “grandfathered” into licensure or living in states that permit alternative training paths can get by with anything less than an associate degree. Most certificates are now in veterinary assisting, which has fewer clinical responsibilities. It is important to distinguish postsecondary certificates from professional certificates. Professional certificates are designed for trained and licensed veterinary technicians who want to become Certified Veterinary Technicians (CVTs), or wish to be certified in a NAVTA-approved specialization. These are generally awarded by organizations within the field and help demonstrate professional expertise. Postsecondary certificates, on the other hand, are awarded by colleges and universities after a student completes an academic program in a specific area of knowledge. So far this guide has emphasized the importance of veterinary technician schools and degrees, but formal training is not the only thing vet techs need to succeed. This section breaks down many of the skills that really set veterinary technicians apart, including those that cannot be learned in a classroom. Many veterinary technician schools teach students how care for and treat a wide breadth of animals in an even wider breadth of medical disciplines. This training works because most veterinary practices are more general in scope, but what about tech who work in clinics delivering more specialized care, such as an emergency room, surgical center, or exotic animal practice? Even vet techs who do not work in these settings may become more experienced with (or passionate about) certain fields of care. Pursuing a specialization can help established professionals as well as current or prospective students hone their skills on a particular area of personal and professional interest. There are two ways veterinary technicians can become more specialized-the first of which is by enrolling in a program that offers the desired area of concentration. Students who want to work in emergency clinics or zoos, for instance, might pursue associate degrees with concentrations in surgical technology or exotic animal care. Because bachelor’s degrees are often designed for veterinary technologists, concentrations tend to be more research- or management-oriented. The second common path to specialization is professional certification. Professional certifications allow new and practicing vet technicians to become certified in certain NAVTA-approved areas, usually by meeting certain education requirements and passing a national exam. Vet techs can be certified in several different areas; for example, anesthesia, critical care, zoological medicine, and equine nursing. For a full list of approved specializations, visit the NAVTA. Brita Fordice did not get her start as a veterinary technician. Like many techs, she was a vet assistant who advanced her career through hard work, training, and a fortunate licensing break. In the following Q & A, Brita shares lessons learned, experiences gained, and valuable insights for the next generation of veterinary technicians. What inspired you to work in veterinary care? I love the medical field, but didn’t want to go through medical school, and definitely didn’t want to work on humans. I was a vet assistant. The photo [I shared] was taken on my first day at a clinic in (Washington State) where I started as an entry-level assistant with my new puppy, Chesney. How did you eventually become a veterinary technician? I attended a few veterinary technician schools around 2001-the Bel Rea Institute of Veterinary Technology and Bryman College online-but was “grandfathered up” to technician after three years of clinical work as a veterinary assistant. I was eligible to take the [Veterinary Technician National Examination] after my residency changed from Alaska to Washington. I studied McCurnin’s textbook for Veterinary Technicians to get my pharmacology and epidemiology up to par for the exam. It was very useful. My college biology background helped immensely as well. Can you tell us about the rest of the licensing process? It was fairly painless. The most annoying part was getting all paperwork together. All prior certificates, continuing education courses, test results, and work history. There was a ton of things to keep track of and submit. What is the best thing about being a veterinary technician? The bond you develop with coworkers in a high-pressure environment and the fact that [you can] work three 13s (three 13-hour shifts) and get the rest of the week off. And essentially getting to wear pajamas to work daily. The first thing many new veterinary technician school graduates do is become licensed. All states require vet techs to be licensed, but specific licensure requirements vary. In most cases, candidates must have associate degrees and pass the Veterinary Technician National Examination administered by the American Association of Veterinary State Boards. Candidates can visit the AAVSB website to learn more about the test and related requirements. New vet techs may also pursue Certified Veterinary Technician designations or other, more specialized certifications. These voluntary credentials can be a major resume boost, but may require specialized training or experience few recent graduates have. Veterinary technicians can research professional certification requirements and keep them in mind when applying for new positions. Most new veterinary technicians begin work in private clinics and animal hospitals, but some head to boarding kennels, animal shelters, or zoos. Those working in practices that treat livestock may even work in the field. Duties vary, but usually include examining animals, administering basic medical care, and performing laboratory tests and procedures. Techs may also assist veterinarians in surgery and teach animal owners how to properly care for their pets. The work can be gratifying, but stressful-especially for techs in busy clinics or settings that handle a lot of abused, unwanted, or critically ill animals. Aggressive and scared animals can also bite, scratch and kick, a hazard the BLS says subjects veterinary technicians to higher-than-average rates of illness and injury. The best way to learn more about the veterinary field is experiencing it first-hand. Internships, entry-level clerical or vet assisting jobs, and volunteer work are all excellent starting points.